Strategies used by World Class Giant Pumpkin Growers are revealed in our DVD’s and Videos. We also offer free giant pumpkin seeds with each DVD/Video order, often from pumpkins over 1,000 pounds! 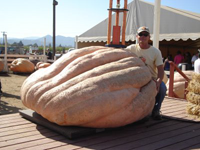 I first started producing videos in 1992, the year I established a New World Record for Giant Pumpkins at 827-pounds. The size of pumpkins has increased tremendously since then. In fact, I have grown a total of 40 pumpkins over 1,000-pounds. Over the years I have identified the finest foliar nutrients, specialized sprinklers, beneficial soil inoculants, and other tools to help others succeed at growing giant pumpkins. It is gratifying to hear from growers all over the World who have used our seeds, the information from our videos, and our growing supplies to produce their own giant pumpkins for competition or just for fun! Our goal is to help growers be successful in growing giant pumpkins and other competitive fruit. We strive to find the best fertilizers and other growing supplies and make them available to competitive growers and regular gardeners. We strive to provide high quality products at the best price available for our customers, even when there are less expensive, lower quality products available. Over the years we have produced 25 different Videos and DVD’s designed to bring the latest techniques to giant pumpkin growers world-wide. We have given away over 30,000 quality giant pumpkin seeds with our DVD’s and Videos. We care about deeply about our world and the people living in it. We donate a portion of each dollar we receive in revenue to charitable efforts. We support The American Red Cross Disaster Relief Fund- world wide, St. Jude Children’s Hospital, Children International, World Vision, Breast Cancer Research, and also our Future Farmer’s of America right here in our State of Washington.